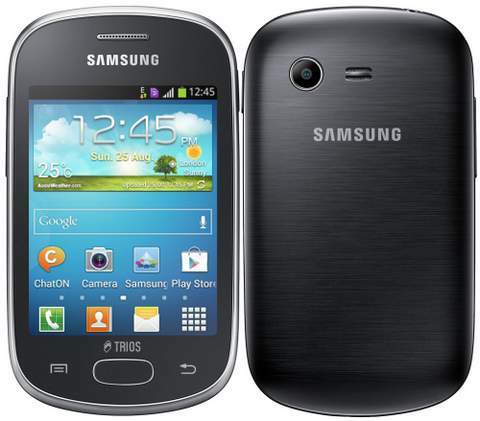 After LG’s Optimus L1 II Tri E475, now Samsung Galaxy Trios ( GT-S5283TABZTO )has been announced with Triple SIM support. There are very few smartphones in the market with Triple SIM support. The Galaxy Trios comes with a 3.14 inch display having 320 x240 pixels resolution. It is powered by 1.0Ghz single core Qualcomm Snapdragon MSM7225A CPU and runs on Android v4.1 operating sytem. The handset comes with entry level specs and which would not be enough to satisfy in many cases. The phone packs with 2MP rear camera without flash and has 4 gigs of internal storage. The Samsung Glaxy Trios is 11mm thick and weighs 105 grams. It features 3G, WiFi, Bluetooth, GPS / aGPS, FM radio and micro USB conductivity. There is 1300mAh battery to make the device alive. The handset is listed on company’s Brazil website. It has 32GB of expandable memory and the RAM of the phone is not known yet. Samsung has included many features to make the Galaxy Trios approachable. The handset is priced at 400 Brazilian Real, which is around RS 11,000 in India.